Hunger and obesity often go hand in hand. It's a contradiction in the starkest terms. The nation's most food-insecure children are also at the greatest risk for childhood obesity, according to a study published in the Journal of the American Osteopathic Association in September. 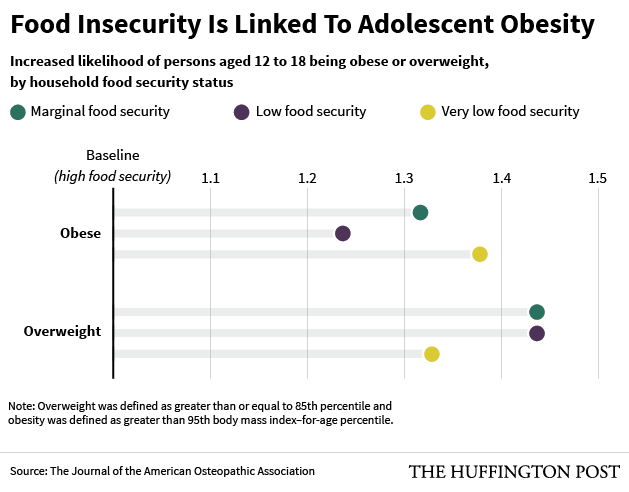 The study surveyed more than 7,000 adolescents between the ages of 12 and 18, finding that participants from the most food insecure households -- defined in the study as having "marginally low," "low," and "very low" food security -- were 33 to 44 percent more likely to be overweight and 1.5 times more likely to be obese. Obesity is linked to a host of health problems, including a higher risk for cardiovascular disease, pre-diabetes, bone and joint problems, as well as psychological problems such as stigmatization and low self-esteem, according to the Centers for Disease Control and Prevention. The United States Department of Agriculture defines food security as "access by all people at all times to enough food for an active, healthy life." People who do not have access to enough food for a healthy, active life are considered food insecure. Fourteen percent of U.S. households qualify as food insecure at some point during the year, a number that rises to almost 20 percent among households with children, according a 2013 USDA report. Even worse, six percent of that group experienced very low food security, meaning a household member changes his or her eating patterns and consumes less food because the household can't afford more. "Hunger and obesity are often flip sides to the same malnutrition coin," Joel Berg, executive director of the New York City Coalition Against Hunger, told the New York Times in 2010. “Hunger is certainly almost an exclusive symptom of poverty. And extra obesity is one of the symptoms of poverty." How can we make our communities food-secure? Healthful, affordable food options in low-income neighborhoods can be scarce, creating a paradox for parents who must choose between food they can afford to feed their children and food that is nutritious. The researchers describe food insecurity as a preventable health threat, one that some organizations are making an effort to diminish. Improving low-income neighborhoods' access to affordable food would be an important step toward healthier communities, but it's a hard issue to upend. School-related policies -- such as the Healthy Hunger-Free Kids Act, which aims to improve the nutrition in school meals -- may be a good starting point, and a safety net for children who aren't getting nutritious meals at home.